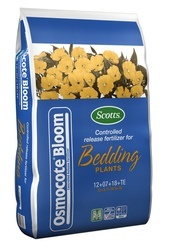 Osmocote Bloom is a specially designed controlled release fertilizer for bedding plants growing in small pots. It is aimed at improving the quality of the plant by providing maximum nutrition throughout the crop cycle, selling and early consumer stages. This provides an overall, complete nutrition programme for the plants. Osmocote Bloom enables the grower to keep the watering and nutrition phases separate. It also contributes to a sustainable way to grow bedding plants with minimal leaching and optimum use of fertilizer. With Osmocote Bloom, plants are fed from the initial potting and continue to be fed even in the first consumer phase, increasing customer satisfaction. Osmocote Bloom has an NPK analysis that is perfect for bedding plants that have a crop cycle up to 2-3 months. The NPK ratio is particularly effective for condensed growth. It also has a full trace element package and the small granules are perfect for an optimal distribution in growing media.